NationStates • View topic - Giant Custom Flags? Why are custom flags so huge? When you use the existing flags they are quite small, maybe 2 inches wide, but when you use a custom flag it is much larger, at least 5 inches across. It shouldn't be an issue to make them the same size, so I wonder if this was by design and if so, why? Perfectania Prime wrote: Why are custom flags so huge? When you use the existing flags they are quite small, maybe 2 inches wide, but when you use a custom flag it is much larger, at least 5 inches across. It shouldn't be an issue to make them the same size, so I wonder if this was by design and if so, why? You can just make your custom flag the same dimensions as the default flags, no? But as far as I'm concerned, the more screen space my glorious flag takes up, the better. One has yet to come. The Snazzylands wrote: You can just make your custom flag the same dimensions as the default flags, no? But as far as I'm concerned, the more screen space my glorious flag takes up, the better. As for the first part I never really tried it but as for the second part in your dreams that's my territory your coming into. When NationStates began in 2002, the average monitor was 800x600 pixels, which meant the standard flags took up a reasonable amount of space. As monitors have increased in resolution, the flags occupy less of the screen. They're now smaller than ideal, but no-one has gotten around to recreating them all. We have increased the size limits on custom flags, though, since that's easier to do. Wouldn't it make sense to get the new flags from Wikicommons since the national and territorial flags there are within the Creative Commons. Unless there's more that goes into the default flags. Last edited by Montmorencia on Sun Aug 13, 2017 7:04 pm, edited 1 time in total. If I recall correctly, there was some resistance to SVG flags because of how badly IE/Edge supports it. However, I am not seeing it as a problem to implement SVG flags, since many of the visitors are using Chrome, Safari or Firefox (or its derivatives). Alternatively, NationStates can use librsvg. Side note, the next update to the flags feature is an opportunity to make sure that the 3:2 ratio flags follow an actual 3:2 ratio (e.g. 108 px by 72 px instead of 107 px by 71 px). Last edited by Minoa on Mon Aug 14, 2017 4:32 am, edited 1 time in total. Minoa wrote: If I recall correctly, there was some resistance to SVG flags because of how badly IE/Edge supports it. However, I am not seeing it as a problem to implement SVG flags, since many of the visitors are using Chrome, Safari or Firefox (or its derivatives). Unfortunately many people still use Internet Explorer to access NS, and since IE can't scale SVG images, it would break the site pretty badly for them. Minoa wrote: Alternatively, NationStates can use librsvg. I just had a play with it and it mostly worked but also caused a few server segmentation faults. If I can get it working, I'll add it. Minoa wrote: Side note, the next update to the flags feature is an opportunity to make sure that the 3:2 ratio flags follow an actual 3:2 ratio (e.g. 108 px by 72 px instead of 107 px by 71 px). So... if this DOES happen, I'll assume that the maximum custom flag sizes will be raised to 324x216 and 432x288 respectively? Evil Tory pragmatist. +161 posts. Sweet chaos | Even sweeter...? * Nat'l Football Team Manager: VACANT! The Self-Administrative City of TINHAMPTON (trigram TIN, pop. 319,372): Factbooks, Tin Stronk! 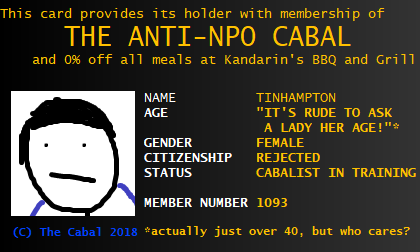 XXI.XI.MMXVIII - NPO DELENDA EST! Shhh! They might be bigger. Christian Democrats wrote: Would you mind explaining what's funny? I'm not seeing any humor. Please do not TG me about graphics requests. That's what the threads are there for. It will likely be no more of an issue, once librsvg is implemented. Please confirm if it works in IE. I recently did some mods to the .htaccess file to allow links to image description pages, so hit Command+Shift+R if it doesn't work the first time.